Yeshe Sangpo Rinpoche is a contemporary nyingma lama, based in Nepal, who studied many years with Dudjom Rinpoche and Nyoshul Khen Rinpoche. Yeshe Sangpo Rinpoche was born in 1945. At the age of four, he manifested a strong desire for a spiritual life and began to read, write Tibetan and recite sutras under his mother’s strict supervision. At the age of seven, Yeshe Sangpo Rinpoche was ordained and studied under Kyangchak Rinpoche. He studied grammar, poetry, songs, rituals, sacred arts and Vajrayana. By the age of thirteen, Rinpoche had already completed his Ngöndro and the Three Roots practices. Kyangchak Rinpoche transmitted all his teachings to Yeshe Sangpo Rinpoche. Later, Yeshe Sangpo Rinpoche went to Dudjom Rinpoche’s Institute for advanced study as his teacher predicted. He received from Dudjom Rinpoche all the empowerments, transmissions and teachings of the Dudjom Tersar lineage. After graduation, Yeshe Sangpo Rinpoche served as Khenpo of the institute for two years. For nearly thirty years, Yeshe Sangpo Rinpoche has studied with Nyoshul Khen Rinpoche. Yeshe Sangpo Rinpoche established Samye Memorial Institute, Samye Retreat Centers and Samye Memorial Monastery. To complete Nyoshul Khenpo Rinpoche’s wish, Yeshe Sangpo Rinpoche and his consort Khandro Pema Chodron have translated into Chinese and published Nyoshul Khen Rinpoche’s masterpiece “A Marvelous Garland of Rare Gems: Biographies of Masters of Awareness in the Dzogchen Lineage”. Currently, Yeshe Sangpo Rinpoche and Khandro Pema Chodron are translating Dungse Thinley Norbu Rinpoche’s annotation of the prayer to the previous incarnation of Dudjom Rinpoche. 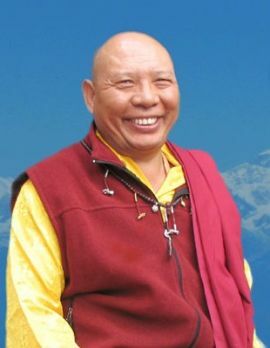 Yeshe Sangpo Rinpoche is fluent in several Asian languages and in English. His students reside in Taiwan, Nepal, the US, Canada, Austria, Japan, Italy and Hong Kong. This page was last edited on 26 January 2016, at 08:17.